This is going to be my Yarn Shop for the next few months. It is very well stocked and very local. I am inspired by Wendy Knits Knit-From-Your-Stash challenge. I do not think I will have the intestinal fortitude to maintain this for 9 months but I will give it a go. The basic rule is "We will not buy any yarn during that period, with the following exceptions..." and it is these exceptions that prove the rule. 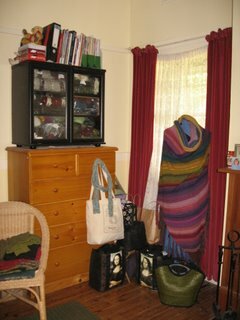 "Purchases made from Blue Mountain Knitter's Guild Retail Guests are exempt because as the Convener I must do everything to make our Guests welcome." The Wool Inn, Belisa Cashmere, Virginia Farm and R & E Reynolds are all scheduled to visit us next year so I will try and be hospitable. 3. Assign. Have the pattern and its source stored together with the yarn. 5. Periodic Evaluations. How well is this working?? 6. Pattern round up and organisation. All those lovely designs printed off the Internet, put them to work. 7. Books books books. Lots of knitting books, weed out the ones that aren't essential, make working copies of some patterns so they're handy for assigning to yarn. 8. Gift and charity knitting. Hi Kate, I like your amendments! I'm hoping that we can all keep each other honest--I for one will promise to 'fess up whenever I fall off the wagon. My first big test will come in February when I attend not just Stitches West, but also an Empty Spools seminar at Asilomar (Calif) for quilting. Yes, there are wonderful yarn and fabric stores in Pacific Grove as well as the onsite vendors... I must be strong! Happy holidays to you--I love your yarn "shop"!! Jane Austen's Darcy - compare and contrast.